Latest addition to ABB�s electric propulsion offering is recognized for pushing boundaries and contributing to further expansion of electric propulsion. 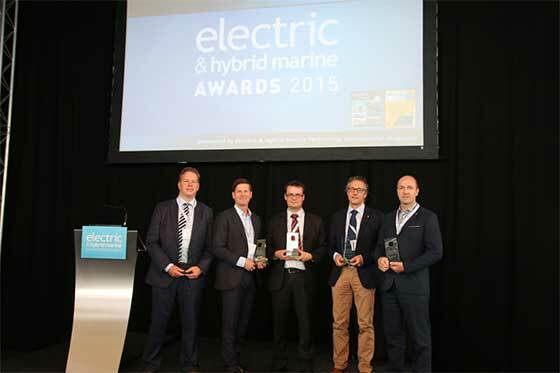 ABB, the leading power and automation technology group, has been awarded the Innovation of the Year Award for the recently introduced Azipod D electric propulsion product at the Electric & Hybrid Marine World Expo in Amsterdam, the Netherlands. The Innovation of the Year Award identifies pioneering technologies that push the boundaries and contribute to making electric and hybrid propulsion possible and viable. The winner was selected by an international jury consisting of 38 maritime journalists, industry experts and academics. ABB introduced the Azipod D in March 2015. ABB's gearless Azipod propulsion system is already the preferred choice of cruise vessels, icebreakers, ice-going cargo vessels and offshore accommodation ships. With the Azipod D, shipping segments such as offshore drilling, construction and support vessels and ferries will have even more choices to benefit from the higher flexibility, reliability and energy efficiency provided by Azipod propulsion technology. "Azipod D allows a wider range of vessel types to benefit from the proven reliability and flexibility that have made Azipod the leading propulsion system across numerous ship types, such as cruise vessels and icebreakers." Azipod D provides designers and ship builders with increased design flexibility in order to accommodate a wide range of hull shapes and propeller sizes, as well as simplicity of installation of the propulsion units. The Azipod D requires up to 25 percent less installed power, which is partly due to the new hybrid cooling that increses the performance of the electric motor by up to 45 percent. ABB's Azipod D propulsion power ranges from 1.6 megawatts to 7 megawatts (MW) per unit. ABB was also named Propulsion Manufacturer of the Year for the second consecutive year.